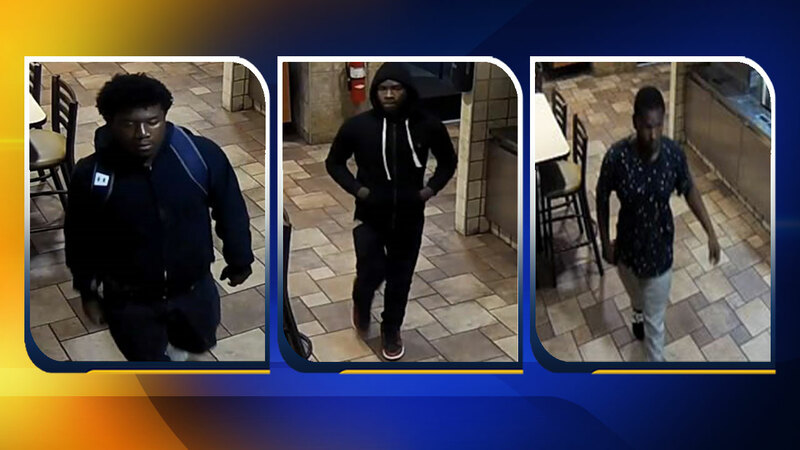 CARY, North Carolina (WTVD) -- Police in the Town of Cary need your help in identifying a group of men involved in an early morning robbery. Authorities say on June 6th around 4:50 a.m., a Starbuck employee was sitting in his car waiting for his shift to start at the Weston Parkway location when four men approached him. One of the men asked to use the employee's cellphone. According to police, when the request was denied, the suspects assaulted the employee and then stole his cellphone and wallet. Police said no life-threatening injuries were reported. A short time later, the stolen credit cards were used at a fast food restaurant in Graham, North Carolina. Surveillance video from the scene showed three of the four men. They are described as African American, between 20 to 40-years-old. The fourth suspect was not captured on video. "Nobody should ever feel unsafe when simply sitting in their car," said Captain Randall Rhyne of Cary's Criminal Investigation Division in a statement. "It's time to see the sun set on this sunrise crime, and we know someone in the public will be able to identify these guys and assist us in bringing justice to this victim." Anyone with information should call the Town of Cary Police at (919) 469-4012 or file a report anonymously with Cary Crime Stoppers at (919) 460-4636.